KEEN London offers sports, games, arts and other activities for children with disabilities and their siblings in a completely safe and fully-supported environment at no cost to their caregiver. Uniquely, KEEN pairs each "athlete" with a trained volunteer coach meaning they can get the most fun possible out of a session: building confidence, making friendships and learning new skills. Children with disabilities from all over London have the chance to take part in sports, games and many other recreational activities. As well as offering sports and games, KEEN also organises trips including ice skating, swimming, climbing and canoeing. We also run two residential adventure weekends every year, offering children an opportunity to stay away from home and take part in new activities and families a valuable weekend of respite. 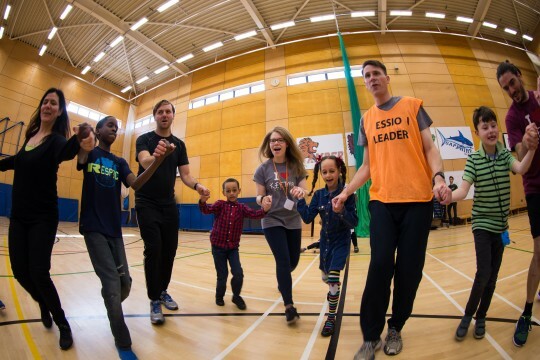 Thanks to KEEN London, children and young people with disabilities have the opportunity to enjoy the fun and games from which they are often excluded. Their families can enjoy valuable respite time safe in the knowledge that KEEN's unique one-to-one support provides a completely safe and enjoyable environment. We provide sports and games sessions with one to one support for children with disabilities and are always looking for enthusiastic volunteer coaches.